Every opened document can be exported directly from the “Document Browser” by clicking on the icon top right. If you right-click on a document name in the “Document System”, you will find the entry Export Document in the context menu. The same applies to a document group, where you can use Export Documents to initiate the export process for all the grouped documents. If you select All Documents or All Activated Documents, you have to select a folder in your file system where you want MAXQDA to save the documents. Document groups are saved as subfolders. To export individual transcripts, right-click them in the “Document System” and select Export Document from the context menu. To export several transcripts simultaneously, select Export Documents from the context menu of a document group. Export as PDF document / Text document / Excel document – Sets the export format. 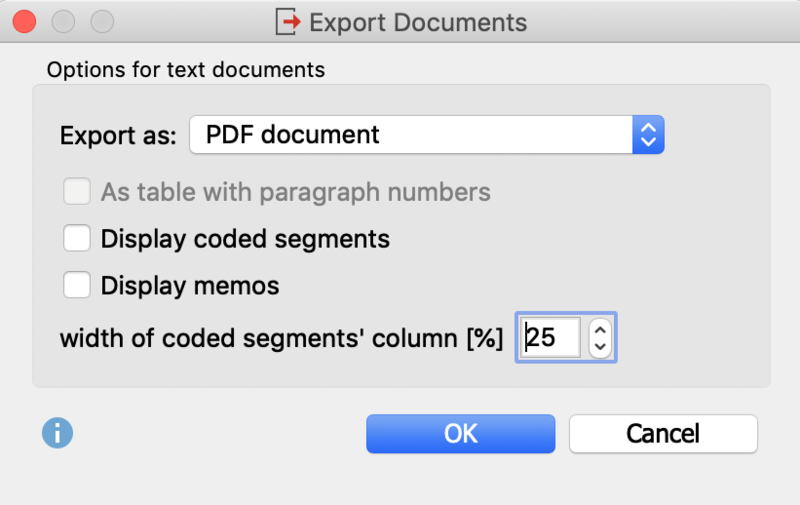 To include coding stripes and memos with the export, you need to select the PDF document option. As table with paragraph numbers – Each paragraph of the text is written in a separate row of the table and the paragraph number is added in the first column (this option can only be selected when exporting as a text document – it cannot be combined with the visualization of codes and memos). Visualize coded segments – The coding stripes are placed to the left of the text (this option can only be selected when exporting as a PDF document). Only those code assignments are exported that are currently selected in the “Document Browser” via the display menu for the coding stripes. The colored background of texts is also included. Visualize memos – If this option is selected, the memo symbols are displayed to the left of the text. The memo text itself is not exported. Width of the coded segments’ column – Defines how much space should be used for the display of the coding stripes and memos. 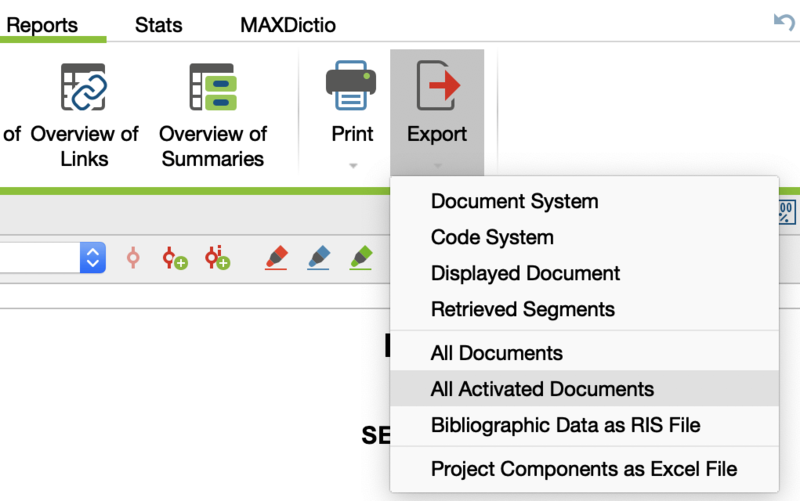 The listed export options are not available for PDF, image and table documents – these are saved as they are stored in the MAXQDA project file.